Sub: RMSA, Telangana Hyderabad - Orientation to the teachers on utilization of K-Yans - @ 2 Teachers per school - Orders issued - Reg. Ref: l. Letter from Mr. Lokesh Bajaj, Vice President, IL&FS Education, dated: 17.06.2017 and 28.06.2017. All the DEOs in the State are hereby informed that, vide reference 2°d cited, a detailed schedule of training to the teachers of High Schools where K-Yans proposed to be provided during the current Academic Year have been furnished. In view of the Ramzaan the earlier schedule of training proposed from 28th June 2017 onwards is postponed and will be conducted from 04.07.2017 onwards. It is planned to provide training to two teachers from High School and training will be given for a batch about 20-26 teachers in one cf the Schools where K-Yans proposed to be supplied. A detailed List of district wise Schools where K-Yans are going to be supplied and teachers are provided with training are enclosed. The DEOs are informed that the selection of Central schools where training is proposed to be given to the teachers of 15 to 20 from nearby schools have been identified by the Nodal Officers during HMs training at Hyderabad. The expert trainers from IL&FS will meet the District Educational Officer on the respective date as per the list enclosed. Therefore DEOs are requested to issue instruction to all the Headmasters to depute 2 teachers per school to the training venue and also to the Headmasters of High School where training venue is proposed. All the District Educational Officers are requested to take necessary immediate action and conduct the training programme effectively. The list of district wise no. of schools and no. of teachers to undergo training and no. of clusters where training is to be organized is enclosed along with district wise list of schools where K-yans will be provided. Qne Sectoral Officer of SSA shall be made In-charge and Nodal Officer to coordinate the training programme. Mrs. Vijaya Lakshmi, RMSA is requested to coordinate the programme from State level. Sub:- RMSA, Hyderabad - Implementation of CLIXs - Training to the teachers on computer skills for the implementation of ICT Integrated Curriculum in the selected 300 schools in the erstwhile three (3) districts of Karimnagar, Warangal and Ranga Reddy - Reg. 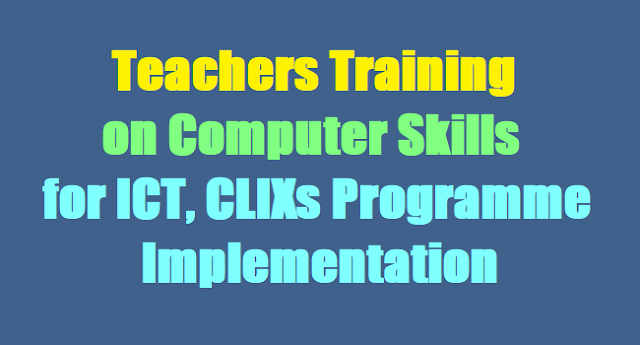 The District Educational Officers of Karimnagar, Jagityal, Peddapally, Siricilla, Siddipet, Warangal (Rural), Warangal (Urban), Bhoopalapally, Jangoan, Mahabubabad, Ranga Reddy, Medchal and Vikarabad are hereby informed that the ICT integration in implementation of curriculum in the subjects of Maths, Science and English is being taken up in collaboration with TISS in about 300 schools in the districts. In this regard, the teachers' need to be trained on digital skills. For this purpose the Resource Persons from the above districts have been trained earlier. Now it is proposed to train the teachers of Maths, Science and English working in 300 pilot schools for the implementation of CLIXs during the Academic year 2017-18. 2-day training was planned per each teacher. Four spells i.e., Batch, I, II, III, IV will be conducted from 19th June to 29th June 2017. The teachers to undergo training will be from the High Schools where computer labs are established. The traaining will be in the existing High Schools where computer labs are being functional. The technical group from the TISS have selected the High Schools for conducting training and prepared the computer labs and loaded the required training material in the computers of school computer labs. The schedule of training on digital skills to the teachers and names of the training centres, names of the Resource Person who undergone training at Hyderabad is enclosed. One MIS Coordinator shall be deputed to each training centre to assist the RPs in conducting the training programme. The Nodal Officer shall monitor and coordinate the training programme duly informing RPs, teachers and MIS coordinator to attend the training programme and instructions to the school Head Master to arrange for the training in their computer labs. only 6 members is enclosed and the District Educational Officer is requested to identify 10 more good teachers to act as RPs and depute to the training. The Nodal Officer, Ranga Reddy should closely monitor this and conduct the programme. The actual conveyance and Rs.100/- as honorarium to the Resource Persons and MIS Coordinator may be paid from the RMSA training budget already available with the District Educational Officers. Actual bus charges may be paid to the teachers where the distance is more than 8 Kms from their school to training venue. Therefore all the District Educational Officers as mentioned above are directed to depute the teachers to the training centres to undergo ICT training and also to issue orders to the Head Masters of High Schools where ICT training is planned to conduct the training and maintain the attendance. The District Educational Officers to depute one effective MIS coordinator to each centre to assist the RPs in conducting the training programme. The list of teachers batchwise, centre wise to be deputed to the trainings enclosed. The District Educational Officers are directed to issue instructions to the teachers to attend the digital training as per the schedule given under. The State level observers may be drafted during the training period to observe the effectiveness of training programme.